My previous trips in 2017 spoiled me. In June, I went on a road trip from Ontario to Alaska and searched for rare birds on the Bering Sea in Nome. In August, I sailed from Canada's High Arctic in Qausuittuq (Resolute, Nunavut) to Greenland while a staff member on the Students on Ice Arctic expedition. 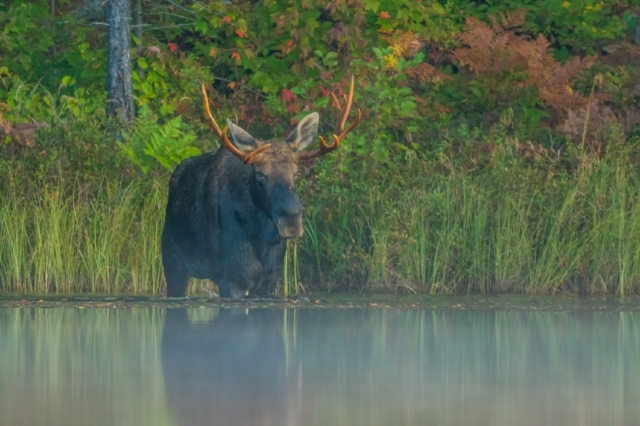 This brief Algonquin excursion was a much-needed reminder that you don't need to venture to extravagent locales or spend weeks on the road to have a spectacular time in nature. 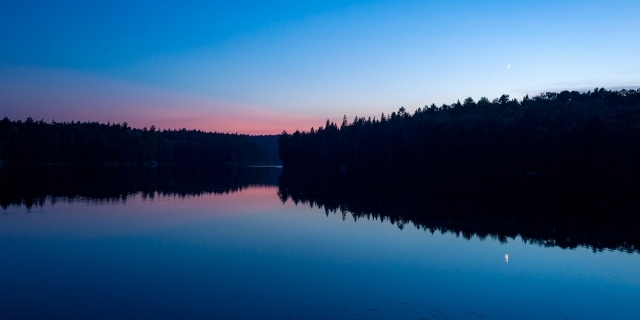 I decided at the last minute to spend one night kayak-camping in Algonquin and opted for an extremely short trip with no portages. I took my tripod, my 300mm lens with 1.4x extender for wildlife, and my manual focus Samyang 24mm f/1.4 lens for astrophotography. I didn't want to haul them everywhere so the lack of portages was important. I put in at a location I had never used before - Sunday Creek, on the south side of Highway 60 across the road from the Spruce Bog Boardwalk trail. It was an easy paddle through narrow Sunday Creek and I arrived at Norway Lake about an hour before sunset. Norway Lake has two campsites; I took the one on the east side right after you enter the lake. The other site was reserved but I never saw or heard anybody use it. I had the whole lake to myself. I anxiously waited for darkness as I prepared freeze-dried spaghetti for dinner. Thankfully, the sky was as clear as my spaghetti was tasteless. Stars and constellations began to appear and eventually the galactic center of The Milky Way came into view. I drifted asleep to the calming sounds of nothingness but awoke startled to aggressive snorting in the forest behind me. What was that? I turned a corner and was happy to see a family of otters hunting and feeding in the water. It was too dark for a short exposure so I did the best I could. I wish I got a sharper shot! I was ecstatic! I rarely see moose with antlers as large as this one had. It didn't stay on the north edge of the lake for long - it swam across the lake right in front of me! It was still quite dark so I maneuverd my kayak to improve the light on the moose. I made sure the rising sun was at my back so that reflections would occur. 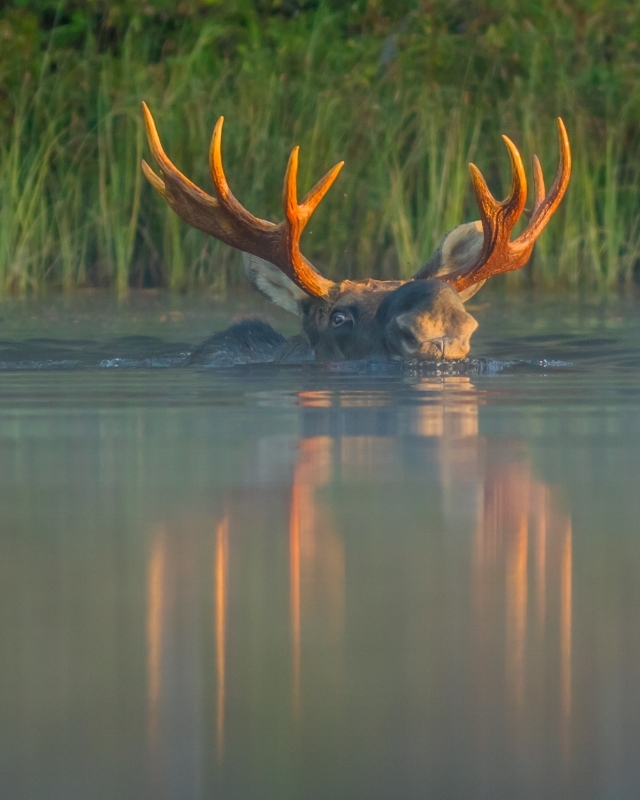 The moose kept an eye on me throughout its quick lake crossing. It was searching for a female and seemed annoyed at its lack of success. What an experience! My trips to the Arctic were incredible but there's also much beauty closer to home.